1922, further inscribed with memorial circa 1945. 3-stage Celtic Cross War Memorial. Bull-faced Aberdeen granite. Approximately 20' high. Reducing 3-stepped base, plinth with carved segmental-headed panels each bearing WWI roll of honour, cross base bearing WWII roll of honour, and long-shafted cross. NE (ATHOLL STREET) ELEVATION: emblem of crossed rifles, anchor and wreath at base of plinth giving way to roll of honour (each face) and 3rd stage with cross base inscribed 'TO THE GLORY OF GOD AND IN MEMORY OF THE MEN OF THIS PARISH WHO FELL IN THE WAR' (roll of honour to other faces). Shaft with sword and entwined banner dated '1914' '1919' surmounted by cross carved with Celtic design. MEMORIAL GARDEN: memorial garden with Empire-style cast-iron supports to timber bench seats. 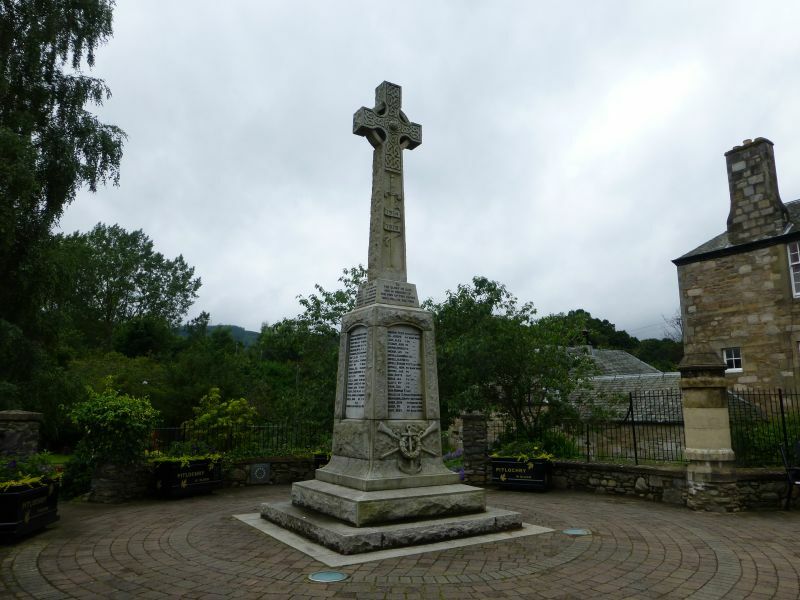 The Perthshire Advertiser noted that "The Moulin Memorial ..... was erected in Pitlochry Institute Park as a memorial to the 81 men and 1 woman, a nurse, of Moulin Parish, and unveiled on July 23, 1922, by Mrs Butter of Pitlochry".